One of our favourite modeling materials is "Keramikal". It’s pretty soft, nice and can be fired in a regular kitchen oven. We used it to make our Hanukiyot (Hanukkah Menorah's) this year. How? First, cut out a paper template. Then roll out the material on a flat surface covered with fabric, approximately the size of the template. 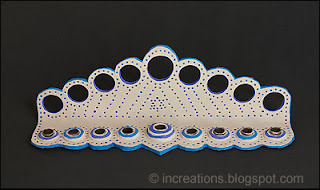 After that, trace the template around, cut out the base and mark the centers of the holes. Use a bottle cap of a suitable size to cut the holes and utilize the cuttings as the base for candle holders. 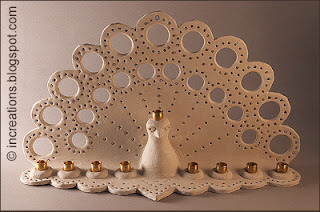 When done with the modeling, press in metal holders into the clay and decorate the lamp with beads. Finally, gently bent up its back and prop it against a vertical surface, a box, for example. Leave to dry for a couple of days. When the Hanukkah Menorah is dry, fire it and decorate using a paint of any type. Ina, the peacock is so gorgeous, you're truly talented! It sure would go well with my Moroccan decor! And thanks so much for linking to me. I'll return the favor soon!